The Blasted Lands by James A. Moore is the second book in his ‘Seven Forges’ series. I haven’t read the first book but I have become acquainted with Moore’s work and I’ve been impressed. There are a number of characters here and it took me some time to feel as though I had gotten caught up on who everyone was and their roles here – one of the problems of joining a series mid-stream. To complicate matters, I started getting caught up in the action of the book. There’s too much going on here to spend much time thinking about the past! Something Moore does particularly well is world-building and his creation of the blasted lands is really wonderful here, and we get the impression that this world is incredibly populated and if we don’t know each character individually, we know them generally. They aren’t just anonymous characters to be disposed of randomly. This world is on the verge of a war. Merros Dulver is the newly appointed commander of the armies of the Empire of Fellein since the Emperor died. But it’s going to be an uphill climb, getting the soft army ready for an unwinnable fight..
I’ve said this before about Moore – his work reminds me of the best of Michael Moorcock. And although it seems to get old to repeat that thought, it came to me again while reading this book. The biggest difference I noticed is that Moorcock’s heroes were contemplative whereas Moore’s are much more active. The downside to this book is that it doesn’t feel like a complete book. It feels like the middle of a longer series (which, of course, it is). As I already mentioned, it takes some time to get up to speed with getting to know the characters, and the ending almost ends mid-sentence. Not quite, but close. I recommend James A. Moore for anyone interested in the sword&sorcery style fantasy, but don’t start in the middle of a series. Looking for a good book? 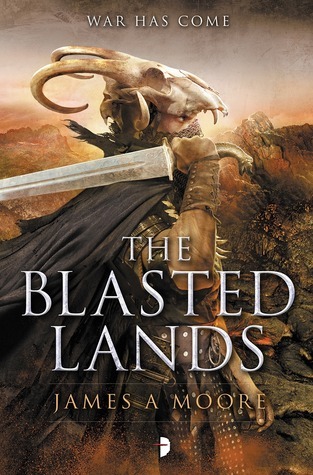 The Blasted Lands by James A. Moore is the second book in a longer series and it will be an easier read if you get to know the characters from the beginning, and don’t plan on being done with the story based on one book.